For those primarily interested in my recent political prose, go to my Current Publications Web Page, formerly entitled “Iraq, al-Qaeda, 9/11”. For those primarily interested in my poetry, go to My Selected Writings webpage. In fact the two genres inter-relate, as exhibited by both my most important prose book, The American Deep State, and my most recent books of poetry, Minding the Darkness, Mosaic Orpheus, Tilting Point, and Walking on Darkness. For a useful overview of my political and poetic work on the Poetry Foundation website, click here. Click here to read about me on Wikipedia. .
Click here to see a description and above all reviews of my book, The American Deep State: Wall Street, Big Oil, and the Attack on U.S. Democracy. Click here for a website which accesses a series of videos in which I read and discuss my long poem Coming to Jakarta, and also my book of shorter poems, Tilting Point. To hear my September 2011 reading of my poetry in Longfellow House, Cambridge, click here. For occasional political comments and news about upcoming books and activities, follow my Facebook page, https://www.facebook.com/peterdalescott. 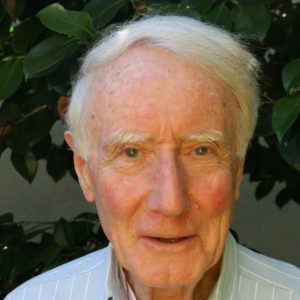 Peter Dale Scott, a former Canadian diplomat and English Professor at the University of California, Berkeley, is a poet, writer, and researcher. He was born in Montreal in 1929, the only son of the poet F.R. Scott and the painter Marian Dale Scott. He is married to the author and psychologist Ronna Kabatznick; and he has three children, Cassie, Mika, and John Scott, by a previous marriage to the Soto Zen roshi Maylie [Marshall] Scott. Before teaching as an English Professor at the University of California, he served for four years as a Canadian diplomat, at UN Assemblies and in Warsaw, Poland. His prose books include The War Conspiracy (1972), The Assassinations: Dallas and Beyond (in collaboration, 1976), Crime and Cover-Up: The CIA, the Mafia, and the Dallas-Watergate Connection (1977), The Iran-Contra Connection (in collaboration, 1987),Cocaine Politics: Drugs, Armies, and the CIA in Central America (in collaboration, 1991, 1998), Deep Politics and the Death of JFK (1993, 1996), Deep Politics Two (1994, 1995, 2006), Drugs Oil and War (Lanham, MD: Rowman and Littlefield, March 2003), The Road to 9/11 (Berkeley: University of California Press, 2007), and The War Conspiracy: JFK, 9/11, and the Deep Politics of War (Ipswich, MA: Mary Ferrell Foundation Press,(2008), American War Machine (2010), and The American Deep State, 2014. His chief poetry books are the three volumes of his trilogy Seculum: Coming to Jakarta: A Poem About Terror (1989), Listening to the Candle: A Poem on Impulse (1992), and Minding the Darkness: A Poem for the Year 2000. In addition he has published Crossing Borders: Selected Shorter Poems (1994, published in Canada as Murmur of the Starsi), Mosaic Orpheus (2009), Tilting Point (2012), and Walking on Darkness. In November 2002 he was awarded the Lannan Poetry Award. Publishers Weekly, October 2010: *American War Machine: Deep Politics, the CIA Global Drug Connection, and the Road to Afghanistan* /Peter Dale Scott, Rowman & Littlefield, $34.95 (408p) ISBN 9780742555945/ In Scott’s view, the American military-industrial complex so feared by Eisenhower has grown into a military-industrial-corporate behemoth. This “overclass,” often functioning independently from the official elected government, has spearheaded countless actions that it perceives to be in the best interest of perpetuating American hegemony. With exhaustive research and extremely persuasive arguments, Scott (The Road to 9/11) seeks to prove that the funding and motivation behind America’s assertion of global supremacy can be traced to drugs. Drug money fueled American actions in Laos and Vietnam during the Cold War, American support of the mujahedeen in Afghanistan in the 80s, and defines American political action in Latin America and present-day Afghanistan. By looking at covert activity and recorded history through the lens of American global dominance, Scott makes a terrifyingly compelling case. “There is no book of history more exciting, more rich, more vital, to understand the secrets of September 11 than The road to the new world disorder by Peter Dale Scott” [The Road to 9/11 in French].